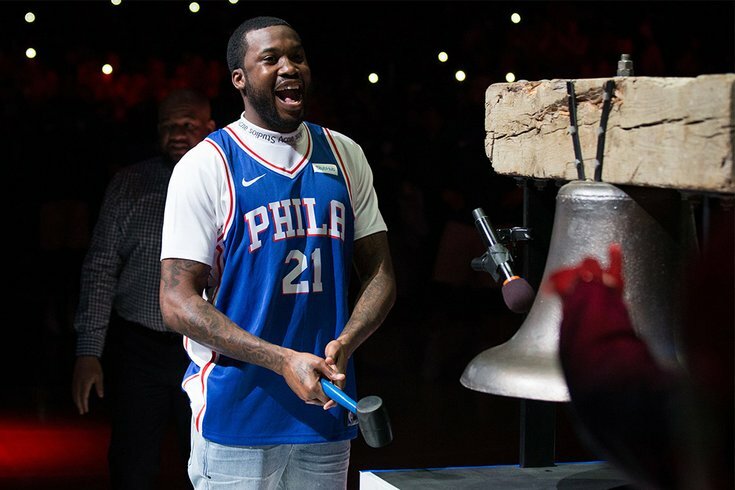 Rap music artist Meek Mill rings the ceremonial pregame bell before action between the Philadelphia 76ers and the Miami Heat in Game 5 of the first round of the 2018 NBA Playoffs at Wells Fargo Center in Philadelphia. Mill was released from prison hours before tipoff. It was just a matter of time before someone stepped up to make the Meek Mill docuseries we’ve all been waiting for. Jay-Z’s Roc Nation and Amazon announced on Thursday a partnership to produce a six-part series to air in 2019. The so-far untitled project will chronicle Mill’s timeline and exoneration through the criminal justice system in Philadelphia and explore its shortcomings. Other parties involved include Intellectual Property Corp.’s Eli Holzman and Aaron Saidman, investigative journalist Paul Solotaroff and documentary filmmaker Isaac Solotaroff. Jay-Z has produced other documentaries — including the highly anticipated Trayvon Martin series coming out in July — exploring the injustices of the U.S. prison system. He’s been particularly outspoken on Mill over the years. Mill, whose real name is Robert Rihmeek Williams, was arrested in 2008 for a drug and gun case when he was 19. He was sentenced to a year in jail, but was let go on early release after serving only five months. Mill, now 30, has been on probation for the seven years. He has routinely violated probation for things like failed drug tests, unreported travel schedules and one incident of reckless endangerment in New York for popping wheelies on a dirt bike without a helmet. Many of these incidents got him arrested. The series will also dissect Mill’s battle with Philadelphia Common Pleas Court Judge Genece E. Brinkley, a judge who has sent other men besides Mill to state prison for violating their probations. A report from The Inquirer in 2017 revealed Mill’s punishment was not an outlier. Mill was freed on April 24 after Philadelphia District Attorney Larry Krasner admitted Mill may have been unjustly convicted. He was granted bail after the Pennsylvania Supreme Court ordered his release.